The long awaited and most propitious festival of Diwali was celebrated on October 22, Wednesday, at Compare’s office with great enthusiasm and show. The aura of festivity dazzled all with its joy and filled everyone with gusto and zeal. In order to enliven the spirits of all, many fun-filled activities were organized, such as ‘Deck-Up your Bay’, ‘Tambola’, and last but not the least ‘Lucky Draw’ with five amazing prizes was like the apex of all the events and brought the day to a splendid end. Since food is an indispensable part of any festival and it is often said that ‘Food and Festivity go hand in hand’, so for that very reason special lunch was organized that graced the Diwali celebration even more. Therefore, the excitement was at its peak and people decked up and beautified their workplace, on the most auspicious time of the year, with several decorative and creative items. People spent considerable time to illuminate every nook and corner of the office. 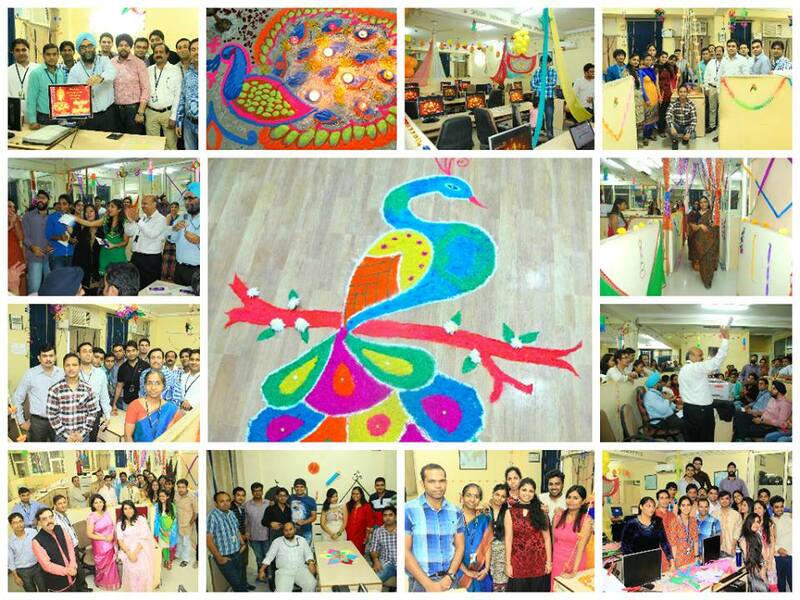 The office was adorned with bright and colorful rangolis, diyaas, wall hangings, and flowers. The radiant and jubilant atmosphere literally made the workplace as the epicentre of all positive vibes. As the day drew close, everyone eagerly awaited the visit of the jury to judge the deck-up of every work station, which was followed by Tambola, a fascinating game of numbers, played in a set of two games. There were cash prizes to be won in the game. So no one let slip this opportunity and assembled on the third floor for fun and frolic. Many won cash prizes and it created cheerful environment everywhere. Thereafter, announcement was made for the winners of ‘Deck-Up your Bay’. First prize (Rs. 1,500) was given away to people from the first floor and second prize called for a tie between the two teams (Diwali Dynamite and Tech Team) from the fourth floor. The ceremonial occasion was then brought to an end by ‘Lucky Draw’ unraveling five exciting prizes – Hidesign bag, Charzon portable charger, Canon printer, Targus bag, and Timex wristwatch. Interesting indeed! And, as per the rules, everyone could try their luck for two of the gifts. But there was a twist to the story, as anyone reluctant to play the draw due to lack of trust over one’s luck could take cash prize of Rs.200/- by returning their lucky draw tickets, which some of them did. Then, the game proceeded and eyes of everyone were glued to the gifts. Everyone held their breath every time the name of the luck winner got announced. This is how the celebration of Diwali came to an end and everybody was exhilarated by the day’s games and events. The festival of Diwali is not just about lighting diyaas and candles, and illuminating our workplace and homes. But it is also symptomatic of illuminating our hearts and souls, instilling positivity with a sense of togetherness and Compare and its Diwali celebration proudly showcased all of that! This entry was posted on November 11, 2014, 9:31 am and is filed under Celebrations. You can follow any responses to this entry through RSS 2.0. You can leave a response, or trackback from your own site.